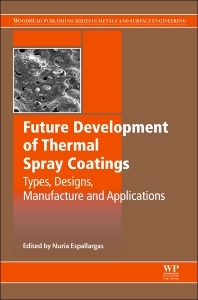 Future Development of Thermal Spray Coatings discusses the latest developments and research trends in the thermal spray industry. The book presents a timely guide to new applications and techniques. After an introduction to thermal spray coatings by the editor, Part One covers new types and properties of thermal spray coatings. Chapters look at feedstock suspensions and solutions, the application of solution precursor spray techniques to obtain ceramic films and coatings, cold spray techniques and warm spray technology amongst others. Part Two of the book moves on to discuss new applications for thermal spray coatings such as the use of thermal spray coatings in environmental barrier coatings, thermal spray coatings in renewable energy applications and manufacturing engineering in thermal spray technologies by advanced robot systems and process kinematics.